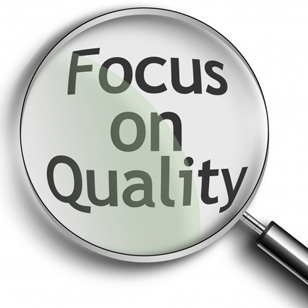 A quality product is reliable, durable, and functional or utilitarian. If it is a machine then it should be efficient too or use the least amount of energy per unit time to do work or perform a function. The only time that efficiency does not play an important role is in fast sports cars where speed is a measure of how good a car is and factors such as reliability and durability are not that important. A home which is passive, efficient, comfortable, reliable, durable, easy to clean, optimizes natural light, and has efficient appliances is a quality home. A quality tool is reliable, durable, efficient, and functional or gets the job done in the least amount of time for which it is designed. If a multifunctional tool is used then it should be one which performs many functions in the most efficient time saving way possible. Sometimes and aesthetically beautiful or ornate product is considered a quality product but looks can be deceiving and the product may not be reliable, durable, or very functional or utilitarian. In food a quality food is one which tastes good, is as organic as is possible with a minimum of processing, and is healthy or nutrient rich. Organically fed bloody meat and organs, eggs, and raw milk are nutrient rich as well as nuts, seeds, beans, fruits, and grains. Vegetables are not that nutrient rich but are good for fiber and minerals. Food polluted with pesticides, herbicides, fungicides, antibiotics, growth hormones, and GMO’s is not quality food!!!!!! Finally, a quality human is a healthy and smart one with a good memory and we should make society reproduce the healthy and smart ones with good memories in greater quantity than the unhealthy and not so smart ones with bad memories. This entry was posted in common sense, education, science, society and tagged common sense, durability, education, efficiency, functionality, quality, reliability, science, society, the truth about quality, truth, utility on April 19, 2014 by uldissprogis.